While resting or aging a tequila in wood casks is not part of the production process, I have included that aspect on this page. In this section we will go over the basic details of each step, and how it applies to the different agave distillates. Unlike most other crops that take one season to grow to maturity, the agave (or maguey as they are referred to in traditional mezcal production) usually take anywhere from 7-12 years before they are ready for harvest. When the agave starts to mature, it will use all the sugar it has been storing for years to sprout its flowering stalk called the quiote. 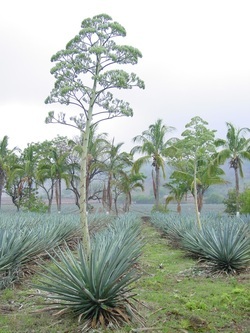 The quiote - which grows really tall, really quickly - is cut from the agave in order to make sure that there is a proper amount of sugar content in the agave for pulque, tequila, mezcal or other agave distillate production. How can you tell if the agave is ready for harvest? Besides using a refractometer to measure the brix level (brix being the sugar content, of which, 24 brix are needed, but higher is preferred) of the agave, Carlos Camarena - owner and Master Distiller at NOM 1139 - Tapatio/El Tesoro, Ocho, etc, compared the agave to the banana. "When the banana is green it is not ripe at all. When it is yellow it is a little sweeter and nicer to look at, so most people eat the banana during this time. When it is brown it is very soft and messy - but it is really sweet and great for cooking. This is very similar to the agave." The most ripe agave will have brown pencas (long spiky leaves) that seem to be rotting, and when you remove the pencas, it will have reddish/brown marks on the piña. The amount of the penca that is removed during harvesting also impacts the flavor and quality of the agave spirit. 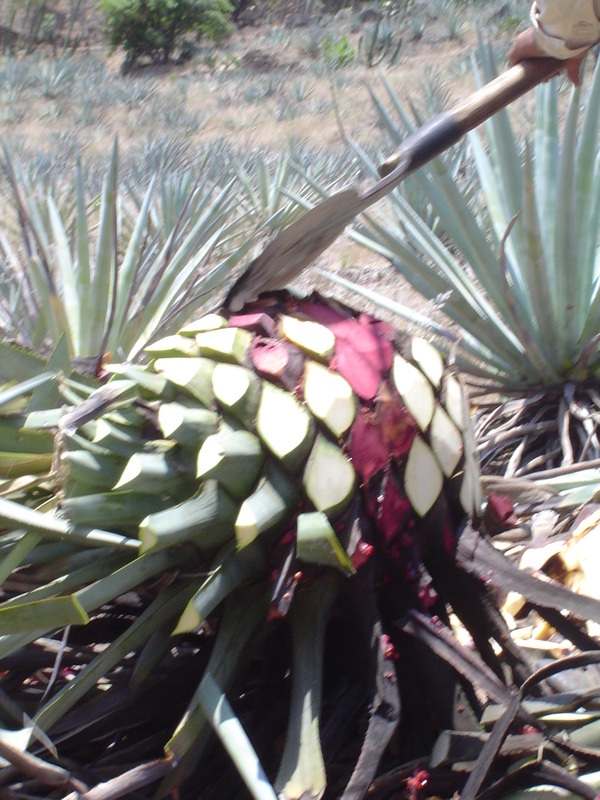 When tasting the cooked agave, you will notice more sweetness in the penca than in the core of the agave. Some jimadors (the hard working men who harvest the agave) may leave several inches of the penca on the piña (as is the case with traditional mezcals), or they may "double shave" it so it is completely smooth and white (for what I would call the "modern tequila"), or somewhere in between. The agave can weigh as much as 100 pounds (or more), and it takes about 15 pounds of agave to make one litre of agave spirits. While some producers keep the agave whole, most will cut them in half or even quarters. A few producers will even take the time to remove the cogollo. This is a small section of the piña that is at the very tip, where the pencas form. The cogollo is very waxy and can impart a very bitter flavor to the distillate. The cogollo is at the top of the agave and this is from where the pencas sprout. Terroir (French pronunciation: [tair-wha]; Spanish: terruño, pago) was originally a French term in wine,coffee and tea used to denote the special characteristics that geography bestowed upon them. It is a group of agricultural sites in same region which share the same soil, weather conditions and farming techniques, which each contribute to the unique qualities of the crop. It can be very loosely translated as "a sense of place" which is embodied in certain qualities, and the sum of the effects that the local environment has had on the manufacture of the product. Just like wine and whiskies there is indeed a terroir for tequila (and other agave spirits). About an hour to the northwest of Guadalajara there is the town of Tequila. This is known as El Valle de Tequila, or the Valley. This area also includes the towns of El Arenal and Amatitan. In El Valle, the elevation is around 4,000 feet, the soil is volcanic, and the average temperature is 75 degrees. -2 hours east and just north of Guadalajara is known as Los Altos, or the Highlands. The main towns in this area are Arandas, Jesus Maria, Atotonilco, and Tepatitlan. Here the elevation is around 6,750 feet, the soil is red clay, and the agave mature at a slower rate than those in El Valle. The average temperature is 64 degrees, with much cooler nights, and typically Los Altos has more rainfall than El Valle. So with all that being said, these are some of the elements of terroir you may find when tasting tequila…. Common dominant traits of tequilas from El Valle de Tequila (the Valley) are typically herbal, floral, vegetal, and earthy. Dominant traits of tequilas from Los Altos (the Highlands) tend to be more fruity and sweet. When the agave is raw, it is very much like wood. So to convert the fibrous starches into sugar, the agave must be cooked. 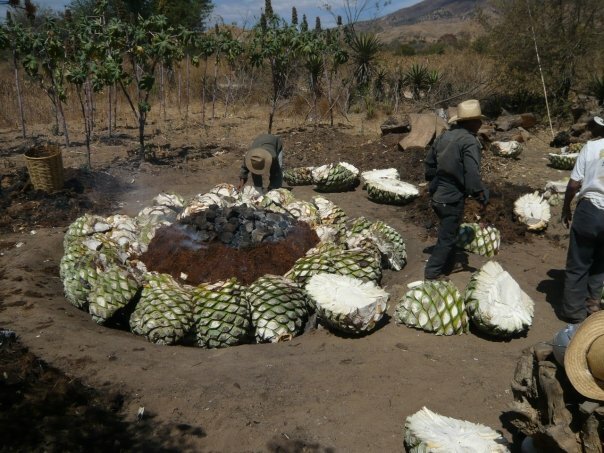 There are several ways to cook the agave: in an earthen pit, a horno, autoclave, or a difusor, and each style imparts its own unique characteristics into the agave distillate. Cooking the agave in an earth pit is the oldest and most traditional method that is still used in most mezcal production today. A 3m wide by 3m deep conical pit is dug into the earth. Logs that are made of various types of oak, eucalyptus or pine, are stacked at the bottom of the pit. I'll let Ron Cooper of Del Maguey explain the cooking, as he does it best: "They place rocks on top of a cubic yard of trunk wood in the form of a volcano. They open a hole in the top of the rocks. They drop hot coals in. They have a fire that lasts 3 or 4 hours. The rocks are red hot. They put the maguey fiber left from the last process over the rocks so the hearts do not get carbonized. They put the hearts on the hot rocks. They cover the hearts with more left over fiber and then woven palm mats then dirt. They roast from 3 to 5 days. They uncover the roast and let the hearts sit for a week and they begin to ferment naturally with airborne microbes." This type of cooking is very similar to a smoker used for BBQing and imparts a smokey, caramelized sweetness and complex quality in to the spirit. Due to the molecular exchange between all of the elements involved, flavors from the earth, rocks and specific wood used for the fire, and even the mats will also contribute to finial flavor of the distillate. It takes 8 hours to load the oven by hand at Fortaleza. Hornos are brick ovens that are usually made of earth from the area where the distillery sits, and are considered "Traditional Industrial". 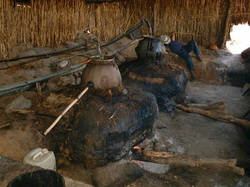 Most of these ovens are heated via steam, but some mezcal/raicilla/bacanora producers still use fire wood or even gas. As for something even a bit different in the industry, Fidencio Mezcal uses radiant heat in their brick oven for their mezcal "sin humo". Depending on the size and the heat of the oven, the agave are usually cooked for 30-48 hours, and an additional 12 hours are allowed to cool them down. During the cooking process, the honeys from the agave are collected. The collection of honey from the first few hours of cooking is discarded as it has the dirt and waxy build-up from the outside of the pencas and is very bitter tasting. The remaining honeys, called aguamiel are very sweet and are used during fermentation. Hornos will tend to add fruit and cooked agave tones, and increase the intensity of a toasted sugar, molassy-caramel bitter-sweetness to the palate and finish. In comparison, cooking with a horno would be similar to cooking with a grill. Autoclaves are industrial stainless steel ovens that use steam pressure to cook the agave. Depending on the temperature and size of the oven, cooking can be done in as little as 8 hours, but for as long as 24 hours. Not only do these types of ovens cook at a faster rate, they do not impart any flavor or charicteristics into the agave. This can produce a much cleaner and less complex spirit, but it certainly does not mean that the spirit is of lower quality. Usually distillates made from an autoclave will have very crisp and raw agave notes. With the exception of a few distilleries, all of the cooked aguamiel is collected and used for fermentation. Although, there are some distilleries that load their agaves on top of a grate that allows them to discard the unwanted cooked agave juices, and keep the sweet honeys. Due to ease of cooking at higher temperatures, autoclaves are like using stove oven - the quicker you cook, the drier and less flavorful the food will be. Distillates produced with an autoclave will usually include crisp, green, herbaceous, and raw agave notes. Difusors are the most "effcient" method for Tequila or Mezcal. This is an automated, industrial machine that does things a little bit differently. 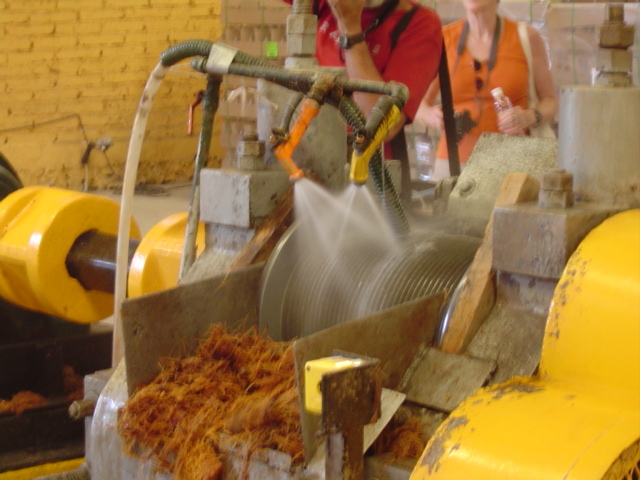 With a difusor (diffuser in english), the agave is shredded into very thin raw slices. 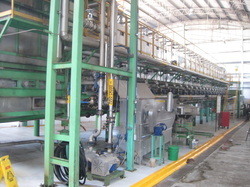 As the agave fibers move across a conveyer belt, hot water,steam (and sometimes sulfuric acids) are used to extract the sugar contents from the agave. This "sweet water" is then cooked before being sent to fermentation. The total time it takes for a producer with a difusor to go from harvested agave to fermentation is 4-8 hours. I like to say that it is the microwave of the tequila and mezcal industry (its also used in the production of rums). This method allows producers to net 99% of all the sugar content from the agave. While that may be seen as a good thing, it also includes the bitter notes from the cogollo and wax from the pencas. If we were to compare this to wine production, the grapes themselves may be squeezed up to 5 times to get all the juices, but the best producers will use the 1st and 2nd pressings for their flagship products, 3rd and 4th for their lower end products and sell the 5th pressing to the people who make $2 bottles of wine. Or if you think of a sweet fruit, the closer you get to the rind, the more bitter the flavor. The difusor does not really allow for an efficient way to remove all the bitter flavors and aromas. While the agave is much softer now that it has been cooked, it still requires a lot of hard work to extract the juices, called aguamiel. 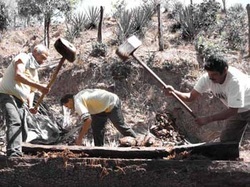 The oldest method, and by far the most labor intensive, is where the agave are placed in a wooden or stone trough and wooden bats or mallets are used to slowly pound the aguamiel from the agave. Needless to say, this is not a very efficient method. 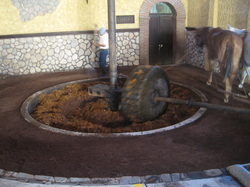 Once this is done, all of the fibers and aguamiel are placed in the fermentation tank(s). The tahona is a large stone wheel that is pulled around in circular stone pit. This traditional process slowly squeezes the aguamiel from the agave - kind of like using your feet to step on grapes for making wine. This is much more effective than using a wooden mallet, but it is still slower and less efficient than a shredder, as it can take 6-12 hours to complete. This process will net about 70% of the sugars from the agave. The tahona is very common with traditional mezcals and even a few tequila makers still have it in use. Most producers using the tahona will place all of the fibers and juices into the fermentation tanks. There are however, a couple of producers who discard the fibers; Tequila Fortaleza and Fidencio Mezcal. People may ask why the tahona is still being used. Well, for the small mezcal producer, modern shredders are very expensive. Also, some of these producers want to keep this artistic tradition alive. But all of them believe that it makes for a better product. Whoever said that you can not reinvent the wheel, never meet Felipe Camarena! A 3rd generation master distiller, Felipe built his own distillery after working in his family's tequila distillery — La Alteña — for most of his life. This new tahona - that Felipe calls Frankenstein - is built from a steam roller with custom made metal dowels. A (1) one horse power engine, slowly moves this new tahona back and forth across the agave. As water is added, the brix content is constantly being checked. In this process, the fibers are also discarded. There are a variety of different molinos (shredding mills) that are being used. Most distilleries use sharp wheels to squeeze the agave, while others will use paddles (similar to a grape crusher/destemmer) to gently press the agave. With both types of molinos, water is added as the agave are being shredded. What takes eight hours with a tahona, takes just a few minutes with a molino. 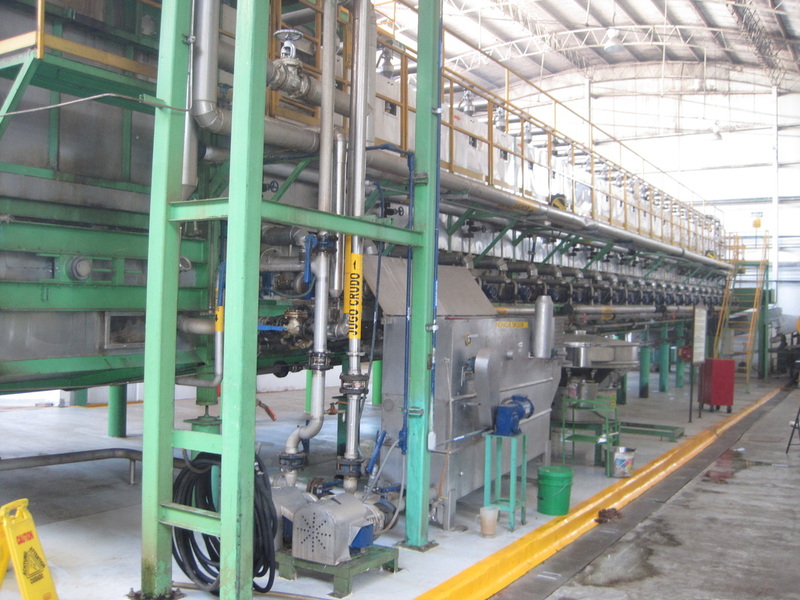 This is a much faster method and will allow the producers to net up to 85% of the sugar content in the agave. 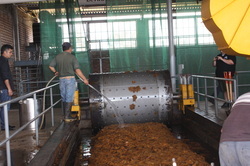 Molinos are the most common method of extracting the agave in the tequila and industrialized mezcal industries. *As a side note. The water that is used for any aspect of production plays a vital role in the quality of the final product. 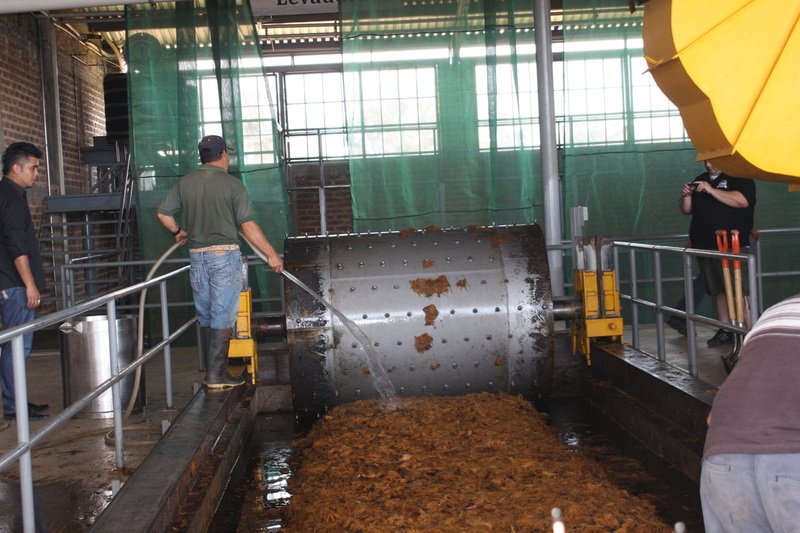 Once the aguamiel is placed in the fermentation tanks, the process of converting sugars into alcohol starts. Some producers will naturally ferment using the yeasts and microbes that live around the distillery, while others will use a proprietary yeast created in a lab. 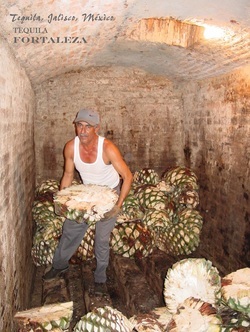 Some producers will even add the bagasso (the agave fibers) into the fermentation tanks. 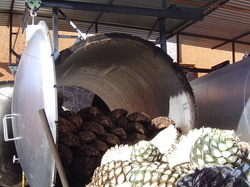 Both wooden and stainless steel tanks are used in the production of agave spirits, although stainless steel tanks are more common with tequila and industrial mezcal. Depending on the temperature, the size of the fermentation tanks, if the tanks are open top or closed, and if a producer is using natural fermentation techniques or adding accelerants, the process can take as long as 30 days - or as little as 12 hours. However long it takes, the goal is to reach an alcohol content of around 5-6% before it is ready for distillation. The fermented aguamiel is now referred to as "musto muerto". There are a lot of micro details in the fermentation process that play a huge role in the notes that we taste and smell in the tequilas and mezcals we drink! A very small copper still at 7 Leguas. Distillation is the process of separating water from the musto muerto by using heat and condensation. After the first distillation, an alcohol content of around 25% is reached. This is called ordinario. It is very cloudy in appearance, and has a lot of impurities. During the 2nd distillation, the alcohol content will increase to 40-65%. The unwanted elements such as methyl alcohols and aldehydes that are in the heads, as well as the heavier elements in the tails, are discarded. *As a side note, there are a lot of flavors and aromas in the heads and tails of agave distillates. Some producers remove as much as they can, while some leave in as much as they can - as long as the methanol count remains under 3000 parts per million. 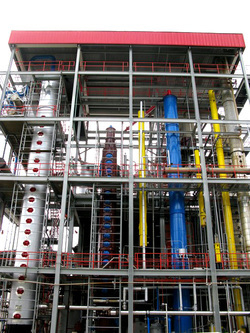 In general 6-8 hours are need for distillation. While the Spaniards were given credit for bringing distillation to the New World, there have been recent archaeological findings that suggest that distillation had taken place before the Spaniards invaded Mexico. One such finding is, the use of clay pot stills - a method that originated in Asia. 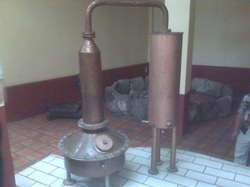 In fact, there are a lot of mezcals that are produced right now, that use these ancient stills. However, the Spaniards did bring with them Alembic stills. These are the most common types of stills you will find in the production of agave distillates. Some are copper, while most others are made from stainless steel with copper tubing. If you think of the act of distillation like gourmet cooking, you would know that the best cooks prefer to use copper pots because of the way copper interacts, caresses and respects the flavors and aromas - but is is also very expensive and needs more maintenance. Column stills are used for many of the mass produced tequilas. Some of the larger distilleries use a Column still, which allows for continuous distillation and the ability to reach an alcohol content of 96%. These stills are very common with vodka and whiskey production as they allow for a much cleaner, yet less flavorfully complex product. Reposados (rested 2-12 months) and añejos (aged for a year or more) are distillates that are rested or aged in oak barrels, while blancos are typically unaged (though a few brands do rest their blanco/silver/plata in oak barrels for up to 59 days). A lot of people will tend to think that the amount of time a product spends in a barrel the better it is. Well, with agave spirits, a barrel will impart some additional flavors, soften the earthy agave tones, and round off some of the edges. And yes, in some case can help make an sub-par product drinkable. When a producer takes their time, and does not rush the process for the sake of efficiency and money, the product that comes fresh from the still is a wonderfully complex spirit, and does not need the help from wood to impart any flavors or to make it "smooth". The most common barrels that are used employed with agave spirits are used American whiskey barrels. This has been commonplace since US prohibition as they are cheap and easy to acquire. Other barrels that are used include new American oak, new and used French oak, used Canadian whisky, as well as sherry and port barrels. A lot of people get into French oak vs. American oak; both are great, and each type of barrel impart their own flavor to the product. Most of the barrels are usually around 200L - some are larger, and some are smaller. Añejos must be aged in barrels that are 600L or smaller, while reposados can be rested in barrels of any size. Within the tequila industry, there are big wooden tanks (called pipones) that can reach 20,000L or more. Along with the type and size of a barrel, the toast on the inside is just as important. Light, medium or heavy, each adds a uniqueness to the aged product. Now here is where it gets tricky: heavy toasts will impart dark colors really quickly, while light toasts don't add much in the way of color. For a very long time, consumers have judged whiskies and brandies by their coloring, but this is really not the case with agave distillates. Before a product is bottled, it goes through a finial process called finishing. This could be as simple as adding water to dilute the product to the alcohol content that is desired for bottling and filtering out the sediments. But this is also where additional coloring and glycerin can be added. There are many who do add color in order to keep a uniform look to their aged products, Those that don't are easy to spot when different lots of the same product are next to each other and have different shades. Glycerin (which is also used as a lubricant in shampoo) is used to as a quick way to sweeten a product and help make it "smooth" . You can find out if the product that you are drinking has glycerin in it by placing a couple of small drops into the palm of your hands. Rub them together. If your hands stay slippery and greasy, and don't dry out after a few seconds, you've got a product that was manipulated with glycerin. *Please visit Ian Chadwick's Tequila website and Ron Cooper's Del Maguey page for more detail about the production of tequila and mezcal - Salud!